Ubisoft is currently in the middle of a major marketing blitz for Watch Dogs 2. It dominated the PAX Australia Ubisoft booth, it has been heavily promoted through the company’s PR efforts all year. It’s obviously a major game for the company, especially given there’s no Assassin’s Creed. Almost (not quite, but almost) released with no fanfare was Eagle Flight. 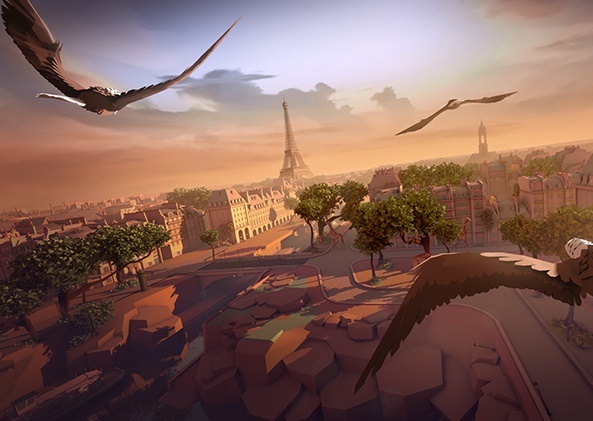 This little VR game, developed by Ubisoft Montreal, with as basic a tool as Unity, received relatively little promotion. In fact, I wasn’t even aware it was in development (or I had forgotten that it was) until I saw mention of its impending release on the PlayStation blog. I’m working on a review now, so I won’t give away too much of my deeper views on the game, but in short: I love it. Love it, love it, love it. Its release around the time America made the most insane political decision in history has helped too; I’ve been able to throw the PSVR goggles on and genuinely escape to a world where there are eagles and other animals, but no humans. Digression aside, I really do like Eagle Flight. It’s a beautiful, heartfelt game in a world that needs more of them, and represents such a creative, innovative and artful side of Ubisoft that you just want to support it. Like Child of Light, Beyond Good And Evil or Valiant Hearts, Eagle Flight is meaningful because it comes from such a large publisher. It represents a respect for the creativity and artistry of games, and it’s the kind of thing that I always, always want to see more of. Indeed, of all the major western developers/publishers, Ubisoft is arguably the most receptive to creative, artful games. It has blockbuster franchises like Far Cry, Just Dance and Assassin’s Creed, and it certainly pumps those out with a regularity that is quite breathtaking. But it is constantly playing with franchises and ideas, too. Assassin’s Creed Chronicles was creative stuff. The aforementioned Child of Light and Valiant Hearts joined Rayman to show off the UbiArt framework spectacularly. In this day and age, Ubisoft invested in the custom development of a game engine specifically designed around bright, colourful 2D environments. And then we have mid-tier stuff. Games like Beyond Good & Evil, I Am Alive, From Dust. These games aren’t necessarily critical darlings, but they show that Ubisoft has the capacity and willingness to invest in more substantial games that can mix real production values with creative ideas which don’t need to be focus-grouped to death. Even with its bigger franchises, like Assassin’s Creed, Ubisoft has shown that it’s willing to be experimental and push boundaries outside of the “main” franchise titles. Assassin’s Creed Liberation was genuinely impressive because Ubisoft put a black woman in the title role… and that just doesn’t happen with other major franchises. So, with all that for context, why does Ubisoft frustrate me? It’s simple; it’s hard to shake the feeling that the company could – and should – be doing far more to develop these niche and, for want of a better word, “big publisher indie” titles, and try to open the mainstream mindset to a broader range of games. After Grow Home was an unexpected darling and found a legion of fans by being a “free” title at launch on PlayStation Plus, the sequel, Grow Up, landed with almost no fanfare whatsoever. Child of Light is a franchise just begging for a sequel, and yet it’s looking more and more like that’s just not going to happen. Ubisoft is able to make annual franchises out of massive, multi-million blockbusters like Assassin’s Creed, but a game that a small team could easily produce on an annual or biannual basis is languishing in the archives. We don’t necessarily need a sequel to Valiant Hearts, but what of Beyond Good & Evil or Rayman? And has Ubisoft really given up on Prince of Persia? I do hope it's not because Ubisoft is concerned that setting a game in the Middle East is suicide to its commercial viability. Part of Ubisoft’s challenge is that the company just can’t seem to bring its mammoth resources together to properly manage the brands of its non-blockbuster properties. Games are released to market with minimal marketing and then those fans they are able to attract are allowed to forget about the game before Ubisoft gets around to announcing a new one (if it does at all). Beyond Good & Evil 2 is apparently in development, but by the time it launches Ubisoft will need to do so much to drum up demand and generate interest that it might as well be starting a new IP. If the game then doesn’t sell in great enough numbers (and as it won’t be a familiar franchise to most there will be some who will overlook it), then it’ll likely be put on the backburner again. I’m not suggesting that Ubisoft should make all of its games annualised properties, because no one wants to burn out on creativity like Child of Light – not the developers, nor the players. But the utterly piecemeal approach (both in terms of promotion and development cycles) that Ubisoft takes to so many of its “lesser” but more creative franchises is frustrating, because it doesn’t give any of them the chance that they deserve. By the time the sales numbers reach executive desks they’re going to interpret lower sales figures as lower demand, rather than a disengagement by the market with them that actually has far less to do with either the quality or audience interest in them, and more each game's raw visibility. Ubisoft deserves to be rewarded for the risks that it takes in greenlighting so many creative, innovative, and downright artful games. If the company could just apply the same principles of brand management it has honed to a fine art with its blockbuster properties, I do think it would see a far more stable and accommodating response from players and the market. Item Reviewed: Ubisoft frustrates me (but I still love 'em) 9 out of 10 based on 10 ratings. 9 user reviews.